Growing rock candy was fun when we were kids, and it's still fun today! 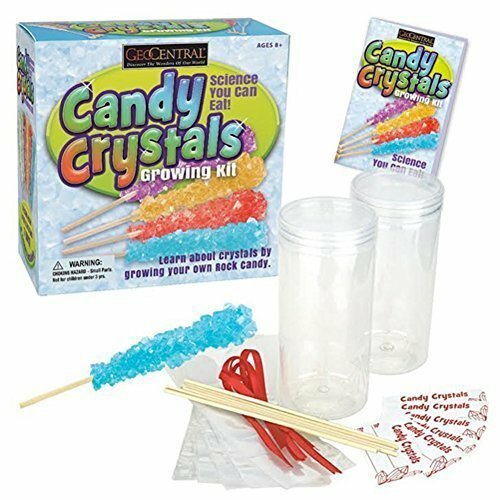 Introduce another generation to this fun edible science with rock candy you grow in just 7 days! Kit includes 2 jars, 6 sticks, 6 bags & ribbons for the candy, labels for personalizing your creations, and instruction booklet. Kit includes 2 jars, 6 sticks, 6 bags & ribbons for the candy. Labels for personalizing your creations, and instruction booklet. If you have any questions about this product by GEO CENTRAL, contact us by completing and submitting the form below. If you are looking for a specif part number, please include it with your message.